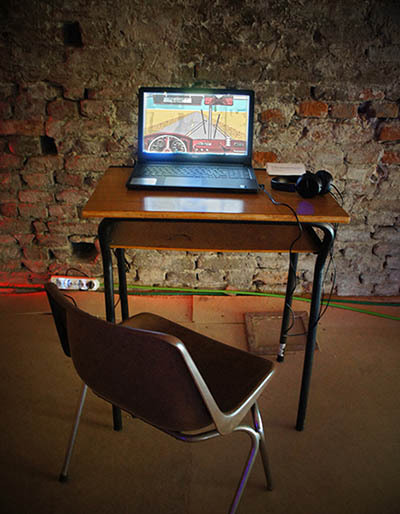 Installation with playable Desert Bus video game, accompanied by spoken-word soundtrack in which the artist describes from memory every overseas trip he has ever made. Known as the most boring video game ever developed, Desert Bus (1994) is a cult driving simulator in which the aim is to drive along an entirely straight road from Las Vegas to Tucson in real time. Nothing ever happens, and there is nothing to see during the 8-hour journey – just an endless pixellated desert. The reward for completing the journey is 1 point. The audio begins with the artist talking about his first childhood holidays abroad, focussing in particular on endless journeys by ferry, plane, and car. Moments of disappointment, boredom or confusion experienced during the trips are described in great detail, while the conventional attractiveness of the destinations is barely mentioned. As they move into adulthood the trips become more and more repetitive, and, aside from a series of unfortunate mishaps, increasingly difficult to remember. Desert Bus was originally developed by Imagineering for the Sega CD console, but was never released. A scratch written Java applet version was recreated for the Desert Bus for Hope charity event in 2007. Thanks to Lance Burns for modifying the applet for this installation. The work has been shown at the exhibition Travelling/Reisen at Group Global 3000 project space, Berlin in 2016; and at Travelogue, Palazzo Ducale, Mantua, Italy in 2016.